As children I think we all had our favorite places to go where we were able to let our imaginations run free. One of my favorites was 'The Old Smokey Ranch.' It was a Christian campground/retreat that was practically in my back yard. I just had to go around a small pond and a very small forest to get there. The ranch was old. It had awesome steam powered tractors and water pumps and all types of wonders that took me back to a different place in time. The owners, Herman and Hendrina, were amazing. It was such a great experience to have known them. I not only hung out at their ranch, I spent countless hours in Hendrina's kitchen. In hindsight, the woman had the patience of a saint. I asked question after question about how she did things. In the modern world where microwaves were just gaining popularity, Hendrina still used a cast iron cook stove heated with wood. It amazed me! It was probably the most beautiful thing I had ever seen. Some day I plan to have one just like it! On one of my many excursions to their home, Hendrina was making cookies. They smelled so good! She offered me one and it's chewy texture and buttery flavor had me instantly hooked. I asked her what they were and she simply said, "Good cookies." And so it happened that in 1978 Hendrina gave me the recipe for her 'Good Cookies'. She told me it was an old family recipe and I am guessing from its simplicity that it came from the Depression Era. Illustrating the power of sharing, this very old recipe has become a current family favorite. And just recently my husband remarked on the buttery goodness of these cookies. And since he has been eating cookies for 40 some years now, he considers himself quite an authority. Spray your cookie sheets now with cooking spray. You'll be glad you did. Mix all ingredients in large bowl except oatmeal and coconut. A mixer works good for blending it all up. Add the oatmeal and coconut and mix in with spoon. Oh, I gave up and took off my rings and squished it all together with my hands. And sticky hands are not good to take pictures with. I found the spoon too tedious. Now, since your hands are already sticky just form some balls about the size of a walnut and place two inches apart on a cookie sheet. Don't get them too close together because these cookies will spread out. Bake for 9-10 minutes until edges are brown but middle is not quite set. The cookie will continue to bake after you've removed them from the oven. If you overbake them they will get crunchy instead of soft and chewy. And we're ALL about soft and chewy! As with any good cookie you might want to have some cold milk on hand. I will wholeheartedly admit that I am addicted to chocolate. Milk chocolate will do but to really get me going I want the bitterness of darker chocolate. This recipe is one of those that looks complicated but is so easy and will give the chocolate lover just what they are looking for. The richness of the torte does not require a large piece so it will serve many. This isn't a dessert you want to take to a picnic because the cream filling does need refrigeration. 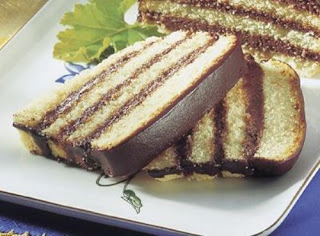 If not you will find your layers sliding apart and very difficult to slice. Cut cake horizontally to make four layers. Don't worry if the layers aren't even. I used a cake leveler to slice mine but a long bread knife will work also. Stir together sugar and cocoa in a medium bowl. Add whipping cream and vanilla. It should actually be a little stiffer than what the picture above shows, but I was trying to rush myself. Place bottom cake layer on a serving platter. Spread 1/3 of the cream mixture on it. Top with last layer. Perfection is not necessary and cream coming out of the sides is wonderful. Melt the butter in a saucepan. Add cocoa and water. Cook over low heat until smooth and slightly thick. This happens pretty fast. Remove from heat and gradually add in powdered sugar beating after each addition. Add vanilla. Whisk until smooth. Pour over layers. My glaze got a little thick to pour because I was pausing to take pictures. It should run down the sides, not cover completely. A wonderful garnish is strawberries. You could also use almonds or any fruit that you think goes nicely with chocolate. ***To post a comment, after you have written your comment, click 'Post Comment.' You will see a preview page, left click just under where it says to 'add a profile pic' or anywhere under your comment that does NOT turn into a hand. Hit your TAB key. This will bring up the word verification. Sorry, I can't find a way around it. This was only an idea I've had for a few days. I searched the internet for some sort of recipe of what I had in mind and couldn't find anything that baked blueberries and cheesecake together. Not to mention in a regular pie crust, most used a graham cracker crust. What follows is my experiment. First I got the fillings ready. For the blueberry I just used a pint of blueberry pie filling that I had canned. With an electric mixer on medium speed, mix until well blended. Now, if you wanted to you could use a store bought crust. I prefer this all-butter recipe. Cut butter into small chunks and add to flour. With a pastry knife or two butter knives held together, cut the butter into the flour and sugar until it is coarse. You do not want to mix the butter any more than you have to. The bits of butter are what give a flaky crust. Drizzle 1/2 cup of the ice water over mixture. (Make sure there are no ice cubes in it.) Mix in and add only 1 tablespoon of water at a time until dough holds together. Use your hands and gently knead the dough in the bowl to help bring it together. It should be crumbly and have a 'flaky' look to it already. Take half the dough and flatten on a well floured surface. Turn dough, making sure there is still plenty of flour and press down some more. Use a rolling pin to flatten the dough, turn, flour and roll until thin. I used a cereal bowl to get the crust almost as big as I wanted. I pressed the circles into a giant ungreased muffin tin. I pressed and shaped as I went along. This is by no means the prettiest pie I've ever seen. I placed 1/4 cup of the cheese filling in the bottom, then a heaping tablespoon of blueberry filling over the cheese. I gently cut through it with a knife. These were larger than I wanted so I layered the filling with more cheese and more blueberry. I cut smaller circles of pie dough and folded and tucked the edges under. I used a milk wash to help seal the edges. Then I sprinkled sugar on top. Don't forget to vent by cutting a small X on top. With the oven preheated to 325F I baked the mini pies for 50 minutes. Once they were cool enough I simply twisted them to loosen and pulled them out of the muffin tin. Now, I'm off to fry up some chicken for dinner to go with these pretty little pies. **Follow up on the pies. As they cook the filling rises and makes the pretty crown you see in the picture. Then as the cool, the crown remains but the filling returns to the size it was when filled. (Just extra pie crust, not really a bad thing.) The cream cheese settled to the bottom and sides of the pan with a little remaining mixed in. The flavor was wonderful! My crust should have been thinner, it was a little too crusty on bottom. All in all, it was a good experiment. There are so many different stories on the origin of hushpuppies that I really have no idea where the truth begins or ends. Here is one reasonable explanation from Wikipedia: Hushpuppies are a food with strong ties to the American South, although they are available in many areas of America on the menus of deep fried fish restaurants. The name “hushpuppies” is often attributed to hunters, fishermen or other cooks who would fry some basic cornmeal mixture (possibly that they had been bread-coating or battering their own food with) and feed it to their dogs to “hush the puppies” during cook-outs or fish-fries. My first experience with these little fried balls of corn was in Southern Illinois at a fish fry. And honestly, I don't like them anymore today than I did then. But Mikey loves them and so do many others. They are rather fun to make and watch puff up and turn golden in the fish oil. By the way, the fish we had tonight was flounder. Mix dry ingredients together. Add milk, egg, onion and corn. Stir to mix well. Set aside for at least five minutes. It should get slightly bubbly and rise a little. Heat oil to 350F. (I just use the same oil I'm frying fish in.) Drop batter by tablespoonful into hot oil. Cook until golden brown. Turn if needed. Liver is usually one of those foods that people either love or hate. Growing up we were never forced to eat liver but encouraged to take a bite. I grew up loving liver and onions. Well, the liver part and the flavor of the onions. I don't actually eat the onion although many that love this dish swear the onion is the best part of the meal. Mikey HATES liver! Not just a little. He can walk into a house a week after liver has been cooked in it and be nauseated by the lingering odor. I could think of all kinds of adjectives to describe his hatred of liver. So why am I making liver and onions while he is home? Because of the Travel Channel. You know all those people that travel the world eating strange exotic foods. One of them talks about how disgusting something looks or smells yet raves about how wonderful it is to eat. That brings us to tonight. Mikey is willing to ignore the smell of the liver cooking so he can taste it. And he will. As I'm writing this preface I do not know how his taste buds will respond to the meal. I know that mine are watering just thinking about it. I won't go into the physiology of the liver but I will say there is a great debate about it's nutritional benefit. There is one definite. Liver is high in Iron. That's a good thing. It's also high in Vitamin A which can be good to a point but too much Vitamin A is not good. Then the toxins that a liver may or may not have. WholeFoods.org suggests that you can enjoy all the benefits of liver without a lot of the risks, by eating calf's liver. They go on to say that calf's liver is less likely to have the accumulations of toxins such as pesticides, hormones and antibiotics found in the liver of older animals. Selecting organic calf's liver provides the greatest assurance that the liver is free of these toxins. Calf's liver is also more tender. I try to get past the calf thing and just enjoy the liver. So tonight we are having calf's liver. Other than being a little more time consuming to cook it is a very economical meal. Start heating enough oil to cover the bottom of your pan on medium heat. Slice onions and place in large frying pan. (Again, I'm using my electric pan because of size.) Saute until lightly golden and limp. Turn with a large spatula to evenly cook. Cover the pan to help the onions sweat and reduce. Using your spatula or a slotted spoon, remove the onions to a bowl. Put flour in a dredging dish (for me it's just a longer serving bowl) with salt and pepper. Mix together. Drain the liver in a colander. The meat is going to be very tender, very bloody and very slimy feeling. Wear gloves if you need to. Gently lay a piece of liver in the flour and press down. Turn liver over and press down again adding flour to the top where needed. Lay coated liver in the hot oil. Repeat until all pieces are done. On medium heat (375F) fry on each side for about 5 minutes until brown. Drain the excess oil off the onions and lay over the liver. Turn heat down to low (225F), cover and let simmer for an hour. You will want to gently move things around occasionally. Now is a good time to make your mashed potatoes. About the time they are done the liver will be finished. The collards we had for tonight cooked almost all day. We like our vegetables soft and mushy. (Yes, even though they lose their vitamins. They just taste better.) I'll post later how I make the collards. I'm not a fan of greens but I really do like the collards. And the verdict is: Mikey still hates it. But at least he tried it. I won't go into detail as to what his opinion was. Such a shame too. The liver was perfect and so tender.